Centennial House: Britton-Evans House, Corpus Christi, Texas. Built on a bluff overlooking Corpus Christi Bay not quite 13 years after the fall of the Alamo, the two-story house has proven almost as enduring as the old Spanish mission in San Antonio. Texans remember the Alamo, but the Centennial House in Corpus Christi is off the beaten path in a city with Texas� largest aquarium, a World War II era aircraft carrier and a long strip of sand and surf called Padre Island. Indeed, the house at 411 Upper Broadway in the center of the city�s business district is only open four hours a week. No matter its relatively low status on the list of Corpus Christi�s tourist attractions, the Greek Revival house has the distinction of being not only the oldest house in this coastal city, but the oldest between San Antonio and Laredo. It also is on the books as the first two-story structure in Corpus Christi and possibly the first house with a basement (and excluding large commercial structures, still one of only a few). One thing the Centennial House is NOT is a century old. Forbes Britton had the house built in the early months of 1849 only three years after Gen. Zachary Taylor�s army left the bay for the Rio Grande Valley to take on the Republic of Mexico to settle the question of who owned Texas. The man who owned the new house had arrived with the U.S. troops, fought in the Mexican War and then returned to Corpus Christi to raise a family and partner in a shipping business. From 1857 to 1861 he represented the Nueces County area in the Senate. In 1858, Britton�s daughter Anne Elizabeth was married to a young lawyer in a ceremony held in the house. The groom was Edmond J. Davis, a future Texas governor. 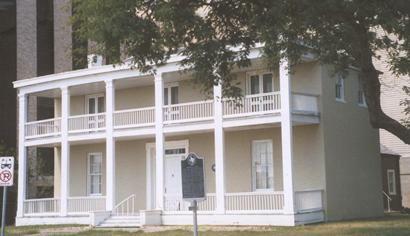 Before moving into the Governor�s Mansion in Austin, Davis fought for the North during the Civil War, a stand that nearby got him hanged in Brownsville. During the war, the sturdy house served as a place of refuge when Yankee gunships briefly bombarded the town. An even shorter Union occupation of the town saw the house used as a federal hospital and officer�s mess. Two years after the war, when a devastating outbreak of Yellow Fever ravaged the coast, the house again comforted the sick and dying. In 1875, only a couple of years after Governor Davis not-so-graciously left office in Austin, Mexican bandits raided Corpus Christi. 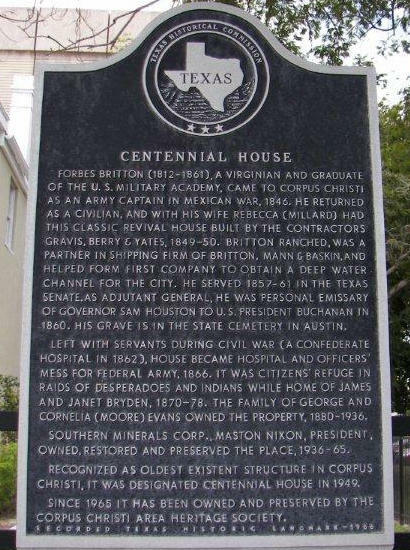 Though no details are offered, a short history of the house prepared by the Corpus Christi Area Historical Society says, �It is said those fleeing from the vicious perpetrators�sought shelter� in the house. Less ambiguous is the role the house played as a place of safety during the periodic hurricanes that have battered the city, the worst of which were an unnamed storm in 1919 that claimed numerous lives and Hurricane Celia in 1970. The reason people sought the Centennial House in times of danger is because it had been solidly constructed of �shellcrete,� a mixture of lime, crushed seashells and water. Its thick walls had three layers of this coastal brick covered with a shell-based plaster. Too, it stood well above the portions of town subject to tidal surge in a severe hurricane. Following Britton�s death in 1861, four families occupied the house until 1880, when soon-to-be Corpus Christi mayor George Evans bought it. His family added improvements and held it until 1936, when the locally-based Southern Mineral Co. purchased it to serve as its headquarters. In the mid-1960s Southern Mineral moved to a new building and the Corpus Christi Heritage Society � created specifically to do what it did � purchased the old house and had it renovated. More formally known as the Britton-Evans House, it became structure No. 76002054 on the National Register of Historical Places in 1976. After all it had been through over the years, the house faced its most serious crisis shortly after the beginning of its third partial century of existence. While doing routine maintenance, workers discovered the mortar in the lower, load-bearing portions of the house had turned to so much white powder thanks to dampness. The heritage society retained a local architectural firm to solve the problem, which threatened the structurally integrity of the historic house. Following completion of the $500,000 repair and waterproofing project in 2002, architects pronounced the house good to go for the next 100 years. The Britton-Evans Centennial House is open for tours from 10 a.m. to 2 p.m. on Thursdays only. Special tours for 10 or more may be arranged by calling 361-882-8691 or emailing info@ccahs.